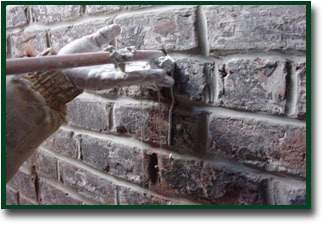 A vital aspect of stone, pre-cast, or concrete restoration is the repair of static cracks by the use of epoxy injection. After the cause of the cracking has been established, and it is determined that a structural or waterproofing repair is necessary, we will recommend the epoxy injection process. Our well trained and experienced mechanics use only high grade epoxies and a pumping system which conforms to industry standards. The epoxy injection process can be effectively implemented on concrete, brick, terra cotta and stone.